lived a lot of my childhood wrapped up in imaginary worlds, creating magical scenarios like in The Lion, the Witch and the Wardrobe, where all I had to do was climb through a fork in the crab-apple tree in the backyard to be able to enter into an alternate reality. We did not have a lot of money, so while my friend, Reika, who lived down the street had the coveted Barbie Dream House, I had an old wooden one-story doll house that my grandpa had made for my mom when she was a kid. But, armed with imagination, you can build a lot with Chrystal Climbers® or LEGOs® —high-rise buildings able to escape the stratosphere, or just teacups with saucers. Because the kids are experimenting with adding weight to the front or back of the car in order to make it go faster, or because they want to add a dragon sail or a whale tail to their vehicle, a large proportion of the cars don’t actually make it all the way down the ramp before breaking into pieces. But the kids don’t mind. They pick the pieces up and redesign their car. And the sky-scrapers being built next door, complete with viewing decks and flag poles, eventually all succumb to the forces of the “earthquake plate” upon which they are built. But, the kids aren’t too worried about it. When I was a kid, the fanciest LEGO® kit you could buy, was a red plastic-divided box with three colors of LEGO®s and a yellow lid that doubled as a building platform. But, by the time my step-daughters were playing with LEGO®s, all sorts of fancy kits had been created. These kits were good and bad—good because it taught them to build something from start to finish, and bad because once the “creation” had been achieved, there was a reluctance to break it all apart and start over again. I think LEGO® realizes this issue though. In one of the recent LEGO® movies, the villain is a superglue cap because, in reality, the dad is creating an entire LEGO® world in his basement, and he wants that world frozen in place. It takes his kids’ anguish over this still-life existence to make him realize that change is the nature of things. Perhaps we all need to learn a lesson from the kids once in a while, and let our imaginations soar to new horizons. We need to let go of our stranglehold on what we perceive to be “reality” and our attachment to it, and, instead, allow our minds and our hearts to visit a place where a car with a dragon sail can fly to the bottom of the ramp ahead of all the other LEGO® cars. Or, perhaps, we can see the value and beauty in going to a place where that car smashes into pieces, and we pick it up and start all over again with bright eyes and a vision for the future. I saw an advertisement recently for a special feeder for baby hummingbirds, who need to eat every twenty minutes in order to survive. This feeder is basically a container for rotted fruits, which produce fruit flies. I had decided to order one to place in the front yard, in our little orchard. We have created a bit of an oasis for wildlife in our yard, and we have several varieties of bird feeders. I thought this would be a great addition. But, yesterday evening, as I was swimming, my attention was caught by a hummingbird who loves to perch on a branch above our compost bin (in which we place all sorts of old fruits, vegetables and plant trimmings). I had wondered why the birds seemed to like to congregate in this area where I had no feeders (because it is a part of the yard that the cats are allowed to be out in when we have our eye on them). And then I realized that we had already created a giant source of fruit flies (and all sorts of other bugs!) for the birds within the compost bins. They had been there all along. This cycle of life within the bins is probably a huge part of the ecosystem of our yard, and yet I hadn’t even been cognizant of it. How many other things in life do we simply “not notice”? And how much more beautiful and sacred could the world with all of her varied creations be to us, if we could be open enough to even catch small glimpses of these workings? Our Western minds are trained to search for patterns and rules. And if we cannot find them, we often try to create them. It is our nature to attempt to substantiate what we believe. But in doing so, we often “miss” the obvious. We don’t see the reality around us. Only recently, researchers in the Yasuni Biosphere Reserve in Ecuador realized that fully half, if not more, of the rain forest’s species dwell within the tree crowns, a complex “three-dimensional world” that we had never fully examined. These birds, insects, fungi, and mammals had always been there, but we had not seen them, because we hadn’t looked. Above our line of sight, within that rain forest, water pools within thickets of bromeliad plants, fifty meters up in the air. Each of these bromeliads can hold up to four liters of water within the gaps between the bases of their leaves, creating small ponds and an entire habitat for several species of frogs. Years of leaves falling from the upper reaches of the canopy into the crotches of trees and into the tangle of vines reaching from limb to limb, have created rich, deep pockets of soil, out of which spring fig and other tree varieties on the moist north and eastern sides of the trees. On the drier, southern, exposures, cacti, lichens and bromeliads endure the cycle of deluge and desert conditions. Orchid gardens mingle with the vines too, creating a lush footing for ferns. The local people, the Waorani, describe the trees not as individual species, but by the context of the trees’ relationship to the rest of the ecosystem. Even when pressed by Western researchers, they could not give the trees distinct names. And the Waorani see themselves in the same light. They live their lives within the context of their culture. Although individual talents and self-reliance are valued, they see themselves as enmeshed within the community, without which they would not survive. And the Waorani are not the only dwellers of this forest who live in symbiotic relationships with other creatures. Indeed, every species here critically relies on its relationships with other species. Leaf cutter ants supply shreds of leaves to gardens of fungi in the sky. And the fungus, in turn feeds the ants. Meanwhile, a species of bacteria makes its home in the hairs of the ant’s body. The bacteria, in turn, oozes chemical fungicides to fight off competitive fungi. English words fail to express the full complexity of these relationships. Indeed, words can limit our full understanding of reality. The yogic sage, Patañjali, described a process of moving beyond word and form. In a way, it is a reversal of the pattern we proceed through as we grow from infants: existing in a world without words, to learning to express the most important concepts in our lives with our first words, to adulthood, when we have learned to solidly place objects, people and ideas into boxes framed by our vocabulary. Once we have reached this final stage, it is hard for us to imagine concepts that do not fit into the molds we have created. It is hard for us to imagine that the native Inuit people of Alaska have many different words for snow, or that the Indian language contains a variety of words for different types of love, or that birds can see a whole spectrum of colors that we cannot perceive. But, rather than rigidly holding onto the mental constructs which we have created, taking a step “backwards” beyond the words and the forms and the concepts we tend to cling to, can actually open up whole new universes to us. When we can begin to see that boundaries we have constructed, not only around the physical and mental environment through which we navigate, but around our own sense of self, are malleable, we are actually more free. When we can sense our dependence on the bacteria, the trees, the sunlight and the bees, we can begin to look outside of our limited perspective of who and what we are. It is in those moments that we can sense that we are part of something much bigger than ourselves. When I was a little girl, probably about seven or eight years old, my family took a camping trip. We loaded up the olive green Chevy station wagon and headed to the Adirondack mountains in Upstate New York. I still remember the smell of the woods—the sweetness of decaying fall leaves, which blanketed the ground, mingled with the resin of pine and spruce, and the scent of incoming rain. The evening was cold, and, after we had set up our tent, my father built a fire. After dinner, we drank hot chocolate out of camping mugs and watched the sparks from the fire float upwards, like lightening bugs. My father, a Philosophy professor at SUNY in Buffalo, was my hero, the smartest man I knew, and he loved to make me think about things that I hadn’t thought of thinking about before. He prodded the fire with a stick, and a shower of sparks rained upwards towards the pitch blackness of the heavily overcast sky. “Have you ever wondered if you might be asleep right now, just dreaming that you are awake?” he asked me. At first, I thought this was a ridiculous idea, but, no matter which way I turned it around, I could not find a way to prove that I was actually awake. He added, “You might even be a butterfly, dreaming that you are a human.” I rather liked the idea of being a butterfly, so I mulled this over for a while. Then he asked me, “how do you know that the color blue that you see is the same as the blue that I see?” This seemed easier to me. Eyes all worked the same, didn’t they? But the more I thought about it, the more I realized that although we may respond to the same color spectrum, our inner representation of the color blue might be different. So, which is real: the butterfly or Zhou, or both? We think we know exactly who and what we are when we are awake. But, at times, in dreams, we are certain of who and what we are, even though that “self” may be completely different than our waking self. And, sometimes, in dreams, it may even appear that we are watching ourselves from outside of ourselves. Are any of these states any more “real” in the moment than the others? Or should we affirm them all equally, but identify with none of them? There is no answer for the conundrum posed in this parable. But, perhaps the lesson to be learned is that it is possible to be a “witness” of different phases of consciousness, whether they be waking , dreaming, or meditative states, or any other state in between. And, we should not necessarily put more value on one state than another. They all have value. And, they are all parts of “us”… or maybe, we are a part of them. [i] Thompson, Evan, Waking, Dreaming, Being (New York: Columbia University Press, 2015). P. 199. Raj, king of the monkey tribe and descendent of the great Monkey God, Hanuman, eyed the clearing in the mango grove. Several juicy golden fruits had fallen to the ground, ready to be eaten. A moist breeze swayed the branch he perched upon, stirring the leaves overhead. But below, all was still. The Orchard Keeper was nowhere in sight. Glancing over his shoulder at his cousin, Sugreev, and the rest of the tribe perched in the surrounding canopy of leaves and branches, he nodded. As one, the monkeys clambered down from the trees and loped across the grassy clearing, all the while keeping a sharp eye out for the orchard keeper, who was a good shot with the rocks he kept stacked up in neat piles around the edge of the grove. Raj scooped up a ripe fruit, biting through the skin to the sun-warmed, nectar-laden flesh inside. Sticky juice dribbled down his chin and onto his hands. Oh, how he loved sweet mangos! Dropping the first one, he reached for another, taking a bite before dropping it and moving to yet another, riper fruit. Thwack! Stars fizzled in front of his eyes. He dropped his mango, clutching his head. Another rock pelted his side. “To the trees,” he called to the other monkeys and they scampered out of reach of the Orchard Keeper’s stones up into the safety of the leafy canopy above. The monkeys chattered wildly amongst themselves. The Orchard Keeper had come out of nowhere. And why did he have the right to control the mangos anyways? The monkeys agreed this sounded like a good plan and waited until the Orchard Keeper, who sat propped up against the gnarled trunk of an old tree, had nodded off for an afternoon nap before sending one of the younger, quick monkeys to fetch a mango for its seed. Raj led the tribe to a sunny patch of dark red soil near the river and there they planted their seed. Cupping river water in their hands, they watered their tree-to-be then sat back to wait and watch. “When will it be a tree?” asked the young monkey who had braved the wrath of the Orchard Keeper to bring back the seed. “I can’t wait to taste our very own mangos!” said Sugreev. The monkeys spent the rest of the afternoon waiting and watching, but no tree appeared. The next morning, there was still no tree. Some of the younger monkeys grew restless and decided to return to the mango grove. But Raj again assured the rest of them that soon a tree would appear. Again they brought water from the river and sat down to watch and wait. When by the third morning, there was still no tree, Sugreev suggested that perhaps they should dig the seed up and check on it. But by evening, when there was still no sign of a tree, Raj consented. Sugreev dug down to uncover their precious mango-tree-to-be. Pulling it from the loamy earth, he knocked off the fragile green start of a sprout that had sprung from the seed. Raj sighed. They had not waited long enough. Even the King of the Monkey tribe could not make a mango tree appear overnight. But such is the nature of monkeys, not inclined towards patience. Already dreaming of the sun-warmed fruits scattered across the clearing in the mango grove, the tribe scampered back to join the youngsters who had left earlier and to spend another day watching and waiting and dodging the Orchard Keeper’s sharp rocks. 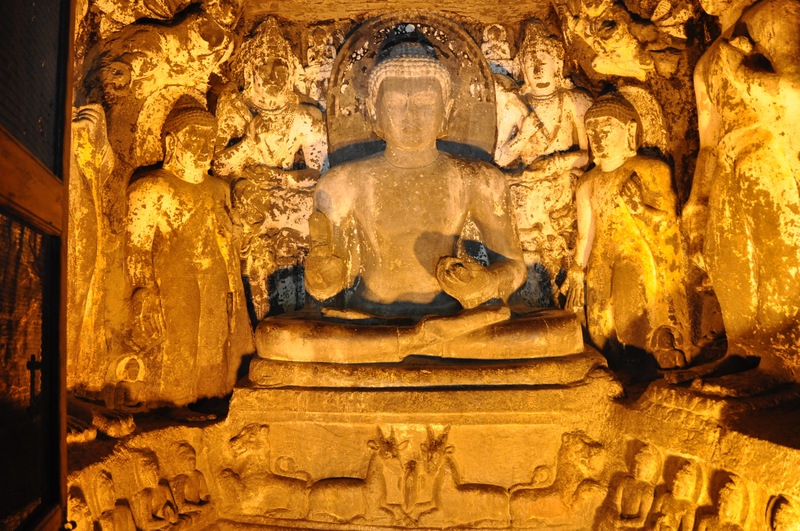 In Ajanta, India, there exists a valley filled with cave temples carved straight out of the stone walls. In the first two caves along the pathway, stories of the Buddha’s lives (from the Jataka Tales), painstakingly painted by the light of candles reflected in mirrors through the windows and doors, stretch in full-color across the walls. Further along in the valley, one of the temples depicts a giant Buddha seated serenely underneath a webbing of delicate arches and columns vaulting overhead. And in the final cave, a 70-foot long “sleeping Buddha” stretches out across the side wall. And, somewhere in the middle, is a cave which was never finished. It was never finished because the artisans, who literally had to remove the innards of a mountain wall to create a temple that fit their “vision” encountered a giant crack in the floor of this cave. It couldn’t be fixed because the process of creating these temples was not additive, but subtractive. In order to express the beauty of what they saw with their inner eye, they had to remove, literally, mountains of stone. Each corbel, each arch, each figure, had to be “revealed” by chipping away the stone that covered it. Yoga is like that too. In Yoga Sūtra 4.3, Patañjali refers to a farmer clearing away earthen dams to allow the water to flow through his fields. The analogy is to the process of clearing away the clutter in our minds, as well as habits that no longer serve us, to be able to allow our true spirit to shine through. Yoga is a process of removal rather than addition. It doesn’t matter how many texts you study, how many mantras you can recite, or how many mālā beads you own. Those things are not going to get you there. Rather, it is a process of removing the impediments, or “cleaning the mirror,” to be able to catch a glimpse of a clearer vision of who we really are. This process is about reaching a more sattvic, or pure state, in which the entanglements of the world do not skew our perceptions as much. It is human nature to create stories to understand ourselves and how we fit into the world. And, it is also human nature to search for support for those stories. And every time we remember them, we tend to entrench ourselves more deeply into them. We even tend to slightly alter them, without realizing it, each time we summon up a memory, to provide more supporting evidence for the novel that is our life. But, sometimes, those stories can create problems for us. Sometimes, our initial perception was not accurate. And, what, really, is accurate anyways? My view on any situation is going to be a little different from everybody else’s, even if we shared the same experience. This is because our perception of any experience is shaped by our past experiences and our past stories. And these are different for everybody. The earnest practice of yoga allows us to begin to shed our attachments to these perceptions to begin to expose the inner beauty of our true essences. It also allows us to be able to exist in the world with less conflict and strife because we don’t feel so compelled to hold on to these stories and perceptions any more. We are able to rise above our own small worlds, and begin to see a “bigger” picture. And like the ancient artists of Ajanta, we begin to reveal our inner beauty. We are able to abide in a more peaceful state, and are able to also catch glimpses of this same beauty, purity and inner peacefulness in those with whom we share this world. A great guru once apprenticed a young boy, a country boy whose family raised water buffalo, to learn to be a yogi. Uneducated, but with the gleam of focus and intent in his eye, the boy had been recognized by the swami as a potential student, a yogi-in-training. However, when the great teacher instructed the boy on how to meditate, the boy found himself unable to concentrate on the image of Viṣnu that the teacher had given him. He fidgeted and grew restless and his mind drifted. Frustrated, after countless days of trying to achieve one-pointed focus on Viṣnu, he gave up and decided to return home. When the guru asked him why he could not focus on Viṣnu, he answered that every time he closed his eyes, all he could see were his beloved buffalo. So, the swami, in all his wisdom, told the boy to focus his meditations instead on his buffalo. The boy immediately found peace with this practice and reported back that he now understood that Viṣnu was everywhere, in everything, even in his buffalo. This is also the story of the yoga we practice today. It bears very little resemblance to the early haṭha yoga practices described in such texts as the Dattātreyayogaśāstra, from the 12th century, which mentions two āsanas: padmāsana (lotus) and baddha padmāsana (bound lotus), but dealt mostly the movement of energy through the body via the use of prāṇāyāma (breath control), mudras (energetic seals) and bandhas (locks or seals), and ultimately culminated in rājayoga, or samādhi. This doesn’t sound much like what we see in most yoga classes taught today. In the west, perhaps we have transformed this ancient practice of yoga into our own form of “buffalo,” a form laden with physical movement and awareness of breath in order to be able to focus our minds. In many places where yoga is taught today, teachers are not even allowed to talk about the spiritual element of yoga. Talking about such things as manipulating energy through the kuṇḍalinī channel can raise some eyebrows in places like gyms and health clubs. And even in a yoga studio, there are always a few students who are highly uncomfortable with chanting or meditating, or who get up and leave during śavāsana. But, I would contend that somehow, somewhere along the way, most of them do find a glimmer of something more. They develop that post-class “yoga glow” and begin to crave that sense of peacefulness they find after putting their bodies through the rigors of a physically-demanding practice. Perhaps this state-of-being needs to be the result of an organic, spontaneous process that should be allowed to flourish individually, rather than always following the course laid out by the ancient yogis. A fellow teacher at the studio where I teach was one of the early yoga leaders in the U.S.. He very intentionally Americanized his classes. He uses no Sanskrit, has his students do a gazillion push-ups, and leaves them drenched in puddles of sweat. But by the time śavāsana rolls around, they are too exhausted to even question the deep state of bliss into which he leads them. One of the beautiful insights from the Dattātreyayogaśāstra, was that, if diligent, anybody can practice yoga, “even the old, the diseased, gradually obtains success in yoga through practice.” Dattātreya tells us that success in the practice does not arise through “merely reading the scriptures” or “adorning oneself with lots of rosaries (mala beads),” but rather that it is the practice itself that is the cause of success. Just as the country boy found his source of inspiration in his beloved buffalo, and it turned out to be one and the same as the source that the great gūrū had been trying to show him, it is possible to find a glimmer of something “bigger than āsana” in today’s yoga practices. The techniques may not look the same as the practices from a thousand years ago, but we all know the experience of “settling into” what has become a familiar place in our practices, a place of letting go, of surrendering to the serenity within. Although the path to that place has changed, the ultimate destination remains the same. Just as the water buffalo boy found his own form of divinity in his beloved animals, isn’t the point of this practice to deal with our own “internal buffalos” and to recognize that we can tap into that place where the salt and the water merge and become one, and where we are all a part of the vastness of this great ocean of consciousness?